Marry for love or benefits? I spend way too much time thinking of what I coulda, woulda, shoulda done in my life — and didn’t. Hannah just received a letter in the mail today from Empire Healthy NY. They are raising rates again — another 7%. I don’t have the letter anymore but I had the feeling that they really didn’t want to do this but they had to. Awwwwww. Hannah thinks I’m obsessed with the cost of health benefits. We ran into Nancy R. at Duane Reade yesterday and I mentioned the cost of one semester of benefits. Apparently I’ve been bringing this up a lot lately. I don’t remember being so concerned about all this when I was younger. I wasn’t even insured way back then. I didn’t have benefits til I married Drew. Let me make it perfectly clear: I married for love and the benefits followed. I don’t know why I have such a hard time keeping up with this blog on weekends. You’d think there was so much happening in my life that I could fill up pages and pages. We shopped for books, we shopped for cheese and eggs. Now we have to decide where to go for dinner. Busy day. Munching on cheese and eggplant caponata right now. Iavarone’s has a good fresh caponata. They have good fresh lots of things. At this time I would like to thank everyone who has taken the time to correct any mistakes they find in my posts. Cousin Paulie emailed me with quite a few already. Nancy pointed out that I misspelled Iavarone. Hannah said I switch between Ask Amy and Dear Amy, and, yes, to all who mentioned it, I do know that I don’t always capitalize names. I’ve corrected some. Will get to the rest soon. Dinner: undecided, at the moment full on cheese, eggplant, and crackers. Do Squirrels Favor Salted or Unsalted Peanuts? I have an idea. I think it will work — think positive. Washing and drying all my laundry now so I can put my plan in action. I went to CVS today and all I could find was salted peanuts in the shell. Yuk, my lips were chapping just looking at the super sized package. I couldn’t bring myself to buy it. I went into Stop and Shop and picked up a jar of Mr. Peanut’s unsalted dry roasted shelled peanuts. Next stop was Ace Hardware where I bought a package of coarse steel wool and D batteries. After that I went to Iavarone’s just because it was there. I didn’t expect to find peanuts but there they were. Roasted peanuts in the shell sold by the pound. So I bought a few. My dryer is vented through the crawl space and out the side of the house. I originally wanted to take the vent off the outside of the house and put a trap on the outside by the opening but all I could think of were those slothy looking paw prints in the snow all around my back yard. I didn’t want anything finding its way in. 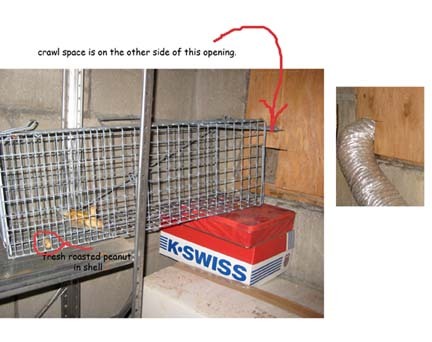 So, my alternate plan is to disconnect the vent and put the trap through the cut-out so half of it is in the crawl space and the closed half is in the laundry room. I’ll leave the light on so maybe the squirrel will go towards light and think it is the way out. I’ll use my last Ritz cracker, some fresh peanut butter, and a few whole peanuts. Almost ten at night and Drew is out with the boys. I think I’ll go curl up by the front door and wait for him.